Shop perspective: Mastery or ? Here are a few photos to give builders some insight to a day in our shop. They were taken the week before we left for the Zenith open house. Perhaps the most important aspect of our work with builders is that I am essentially a homebuilder myself. 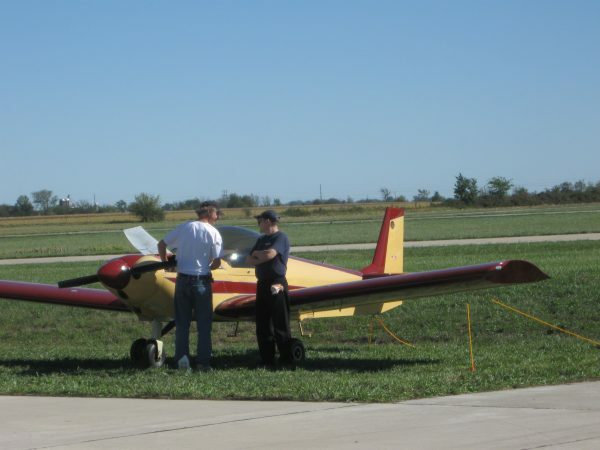 In our industry, there are countless companies staffed by people who have never turned a wrench on a homebuilt aircraft. These people have little or no understanding of the needs and capabilities of rank and file homebuilders. Many of these sales people have no exposure to real builders beyond handing our brochures at Oshkosh. Very few of them have ever made a single house call to a builders shop, and consequently have little real connection to traditional homebuilders. We are on the other end of the scale. Over the last 20 years I have held 23 major colleges and made something like 400 house calls. This is a lot of opportunity to listen to builders and really get to know them. Until you do this, I can make a good argument that you are not really in a good position to be an asset to builders. Yes you can sell them things, but until you know them, you don’t even know if builders are installing the stuff correctly, far less learning anything nor improving their own personal capabilities. Look at the photos below and notice that my shop and hangar may be a little messier, or have more old school tools, but it is still a homebuilders shop. A product producer who has a spotless CNC shop, but never works on aircraft directly, will have a distorted view that technology rules the day in homebuilding. It doesn’t. Craftsmanship will always be paramount. No matter how the part is made, a human, (an amature not a professional in homebuilding) will have to bolt this part on and operate it. Unless you understand these builders, and are willing to invest effort in assisting them in the development of their personal craftsmanship, you are not going to make a difference. technology is an important tool in the process, but it isn’t the focal point. It’s called homebuilding for a reason….if every part was made exclusively in a high-tech factory and came pre-installed, you could drop the name Homebuilding and replace it with the term Factory-buying. At Zenith I met a guy who was having a different brand of aircraft built for him. He was dropping some big checks to have his airframe built, have a buy-it-in-a-box engine installed, and another guy paint it. Almost everything the guy had to say was a frustrated complaint. Little surprise, he had gone to great expense to remove every satisfying element from homebuilding and replace it with a consumer experience, had attempted to negotiate a leveraged exchange rate for the craftsmanship of others for his dollars. In direct comparison, I had a number of corvair builders share pictures of things they were very proud to have created with their own hands. There is an obvious truth that people who make things are happier than people who buy them. Above Grace is sealing parts, hardware and instruction sheets into sealed bags. This is in one end of our 20x 30 shop. It is disorganized because we were packing up the trailer to head out to Zenith. The shop is usually full, but neater. For the most part, Just Vern and I work in the shop, so it’s small size is not a problem. It is well lit and has central heat and air. (It is attached to our 40×50 hangar, but the hangar is truly ‘climate controlled’, in the sense it is hot in the summer and cold in the winter.) Look Closely and you will see the Scoob E. is lying on the chair behind Grace. He tends to spend 23 hours a day within 10 feet of her. 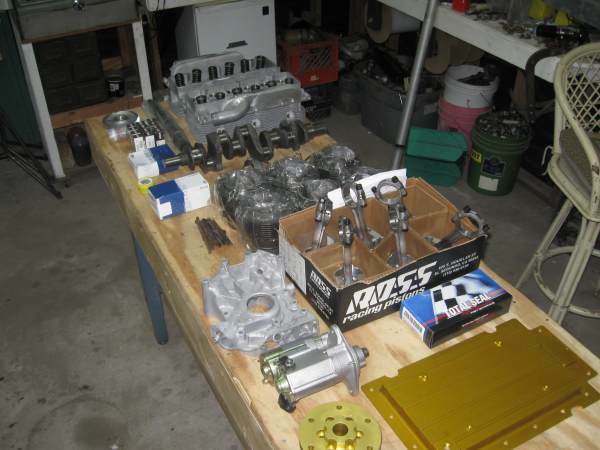 Note the high-end parts that went into Gary’s engine. The Falcon Heads are vastly better than any Corvair head that every left the factory; The pistons are Forged, CNC machined and made in the US; The crank is fully stress relieved and deep nitrided. The engine components are far better than the ones GM used. Corvairs were rated up to 180hp in the car, redlined at 5,500 rpm. Not only do we use far better components, bet we simultaneously flat rate the engine to 55% of this power output 58% of this rpm limit. This is the root of all the success of the Corvair engine as an aircraft power plant. It is truly an automotive Conversion engine, because we have converted in the form of substantial internal improvements while flat-rating its output. This is the only rational way to expect a car engine to reliably do the job of an aircraft engine. 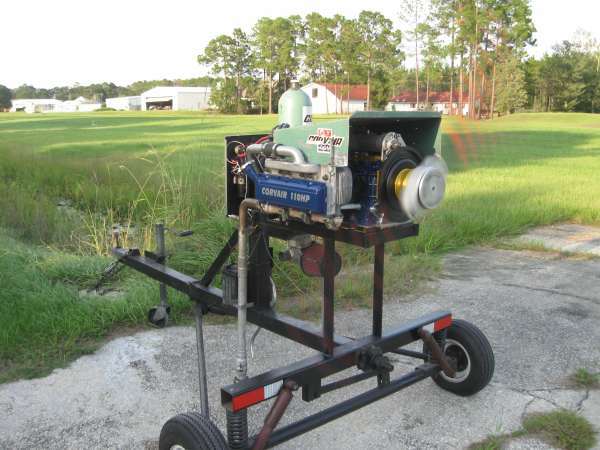 Over the years, there have been countless companies that tried to promote the concept that a car engine rated at say 100 hp at 6,000 rpm can have a reduction bolted to it and be put directly into a plane, and then asked to reliably produce 100hp and turn 6,000 rpm. Everyone understands that if you drove your car like that it would have a short life span, but many people bought into this idea because they wanted to believe it. These engines were called auto conversions, but in reality they were not….they were just auto engines, being asked to continuously develop power at high rpm. Most of these engine came out of cars that were wrecked, many were out of designs marketed to 18-24 year olds, most of whom have no concept of auto motive maintenance like oil changes. When asked what they would do if their stressed engine broke, almost all of these people said, “I will just go get another from a junk yard” as if every aircraft engine conveniently breaks on the ground in front of a snap on tool box. You can’t teach people who don’t want to learn nor consider any thought that would challenge something they have a big emotional investment in believing. I don’t try, I am just here to work with people who wish to learn more about how they can become their own engine builder, and maintenance department. Some people would gladly take the word of a junk yard operator that the engine he is selling is read to fly. Corvair builders are the kind of people who would much rather count on an engine based on a 52 year track record of steady improvement on an excellent design, that they built with skilled hands, with conversion parts specifically designed to make the engine reliable. Which engine you gravitate toward depends entirely on what kind of person you are. Above, Gary’s 2850cc engine at power on the break in stand. A fundamentally simple engine, that we have a long track record of expertise with. Safety in aircraft is all about understanding and having mastery of the machine you are operating. You can not show me a single person who was ever hurt in a plane because he understood too much about it, but I can show you countless statistics that used to be humans who got caught operating a machine with pass-able skills when the moment required better. I do not have an instrument rating nor a multi rating. If I wanted either, I am sure I could write a check to a ratings mill and have enough skill in 10 days to do a passable job on the check ride. People who actually have mastery of muti and instrument flight understand that neither of these are forgiving of “pass-able” skills when it counts. I can make a good case that this extends to every skill set in aviation, that safety lies in mastery. My personal concept of what I want to do in aviation is mastery of the stick and rudder VFR planes that I like. Because I am a homebuilder, I am also speaking of mastering the building of this plane, and it only makes sense to me to know the power plant, and I mean really know it, as well. 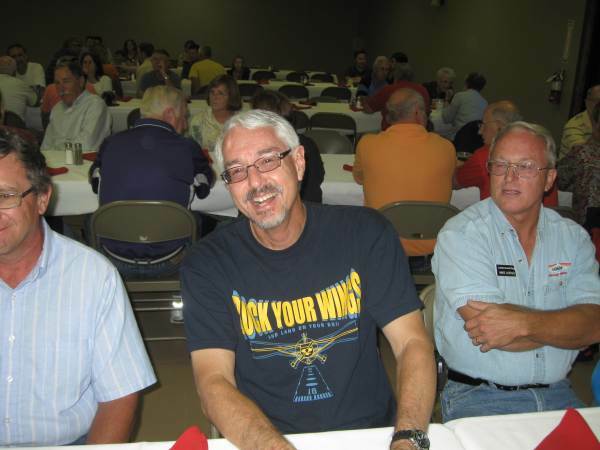 Here are a few photos and thoughts from last week’s Zenith open house celebrating 20 years of operation in Mexico, MO. (Zenith has been in operation more than 30 years, but was based in Canada for the first years.) After I took them, I realized that almost all of them were shots of people. This is fair enough, because in the real measure, homebuilding is about people and their hard work to achieve something extraordinary in their lives, people un willing to settle for what others will accept. This month marks 9 years since Grace and myself bought our 601XL kit from the factory. When it flew several months later, we started the era of ‘Zeniths powered by Corvairs’, something we shortened to “Zen-Vair.” The years since have seen almost 60 more Zeniths take to the air with Corvair power. We now have another 50-60 aircraft that could fly in a year, and a completion rate that is close to one every 12 days. It is a success story make possible by Zenith providing outstanding designs that are well supported. Choosing an airframe is something of a marriage between the builder and the factory. In the case of Zenith, they have a long track record of successfully working with builders of all experience levels. They are one of the longest lasting and most stable companies in our industry, and as one of their builders, I will gladly say that they are first class people to work with. Some people show up everywhere. Albert and Dan Glaze have been to the last half-dozen Corvair Colleges, a number of airshows and several Zenith open houses. Dan’s engine ran at Corvair College #20 in Michigan last year. Yet he and Albert return to events to give back a little more than they received, a common thread in the Corvair movement. These two long time friends have an ongoing comedy routine like Bing Crosby and Bob Hope. 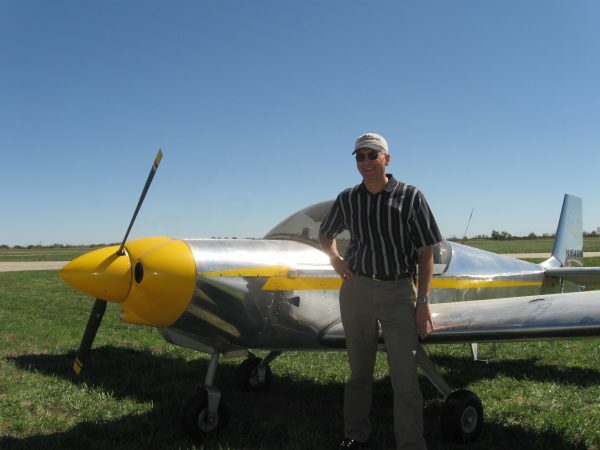 Dan’s aircraft is a 750. he is now past the 75% mark, and having the engine done and running is a lot better feeling than having a big expense looming in the future. 650 builder and pilot Dave Gardiea. His aircraft was the polished one with the red nosebowl. 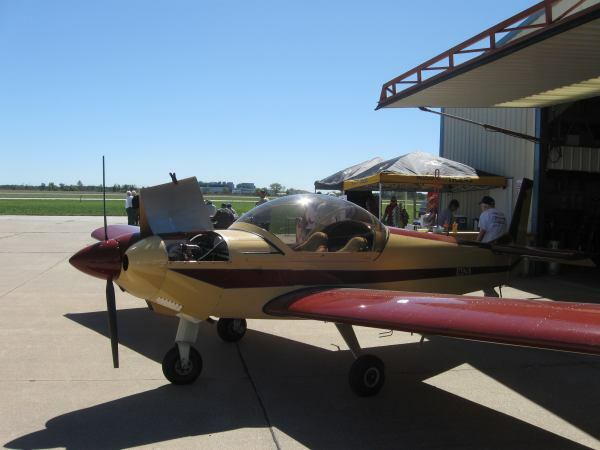 Dave’s plane has also been seen at Oshkosh, and is another outstanding example of the breed. Although I like pretty much anyone into homebuilts, Dave is a good example of the self-reliant, thinking kind of builder that we attract to Corvairs, easy people to admire and get along with. At first glance, builders considering engine choices often compare weights and prices. truthfully, finding the best match for your plane is much more about your personal goals in homebuilding. For people who want to know everything about their aircraft, on both sides of the firewall, we have the Corvair. Delton Perry and his better half. He is closing in on finishing his Zenith. Last year, at College #21, Delton ran his magnificent engine. A life long mechanic, his powerplant displayed a very high level of detail and gave a very smooth test run. Sebastien speaking at friday night’s dinner. He made sure to personally thank his staff for the success of the factory. When he recounted how long each of the people had worked there, it stood in contrast to many other aviation companies that go through employees like water, unable to generate stability nor loyalty required to attract and keep a first class staff like Zenith’s. Craig and Valerie Westedt. The both came to Corvair College #22 in Texas and CC#23 in Florida earlier this year. Craig is quick to point out that the project is actually Valerie’s build, he is playing the support role. At the Zenith dinner Valerie won a deluxe VIP Oshkosh Package from the EAA’s president, Rod Hightower. It included an up close parking pass. All the Corvair builders who have met Valerie understood she isn’t going to need the parking pass, as she is determined to fly into Airventure. Lynn Dingfelder’s 601XL(B). This is the first time I have seen his plane since he flew it into Corvair College#20. The engine is a 2700cc power plant with a Dan bearing and an Elison EFS-3A carb. 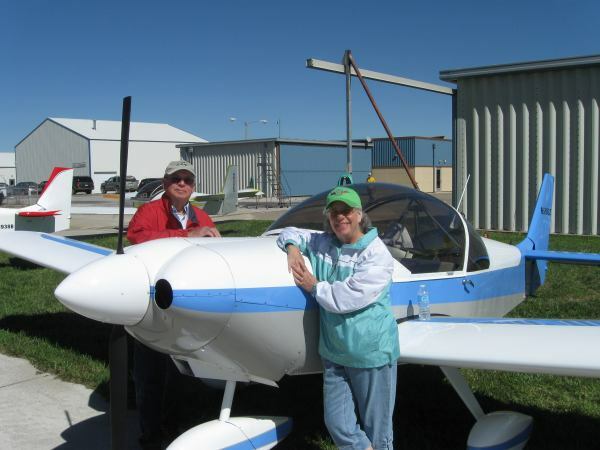 Shane and Phyllis McDaniel stand in front of their 650, which was the first amature built 650 in the country. They brought it to Oshkosh to great praise, it is a outstanding example. They recently finished a 601XL, also Corvair powered, for a his and hers combination. They are both skilled builders and pilots. Both of their aircraft have 2700cc engine with Dan bearings and MA3-spa carbs. 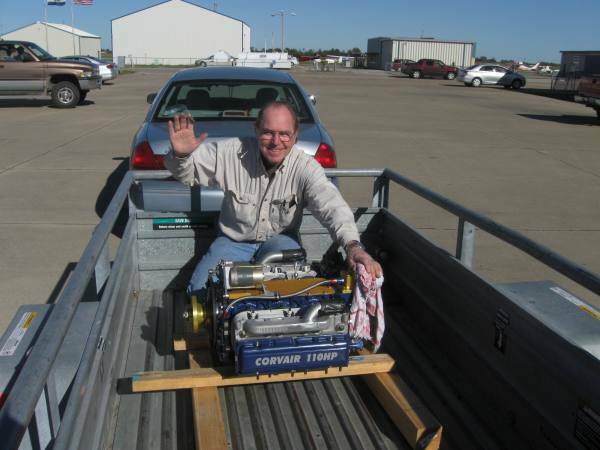 Dr, Steve Minart, of Iowa, stands beside his 2700cc Corvair powered 601XL(B). His aircraft was the 4th Corvair powered Zenith to arrive at this years event. Over the years we have had a steady stream of builders bring their Zeniths to Mexico, Colleges, Oshkosh and Sun n Fun. This is the best measure of success. Sales numbers mean little, I am in the game to get people flying. Our Corvair program for Zeniths has been around a long time. On our 2005 Midwest Night School tour, one of the stops was Dr. Minarts home. Here today, gone tomorrow companies in experimental aviation have stolen more builders dreams than most people first guess. Few people understand that less than 10% of the firms in our industry 20 years ago are left. Even many of the familiar names went through ownership changes and bankruptcies, often at builder expense. Zenith’s record is a complete standout in our industry. Above, Mark Petinunas of Falcon machine speaks with Lynn Dingfelder about Lynn’s 601. Mark ‘Petz’ is one of our Corvair All-stars. He came down to the open house to meet with builders and Deliver a 3,000cc Corvair that is destined to power Clark Taylor’s 601XL. Because we are primarily in the business of teaching people how to build their own engines, the Corvair All-Stars are all mechanics and builders, not sales people. Above I stand beside Ray Huffman from Lexexa Kansas. who has a long personal history with aviation. I noticed his hat and asked him about it. 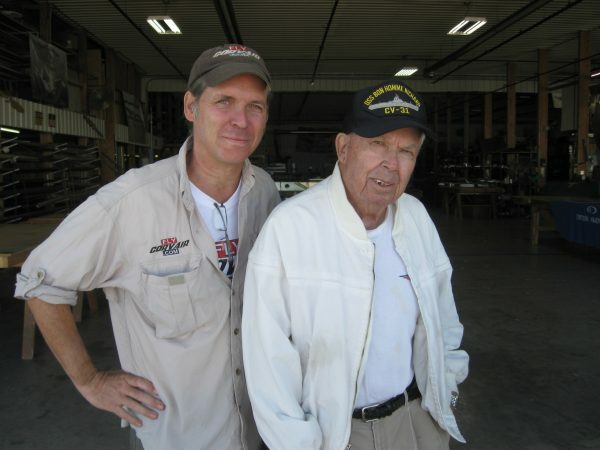 I listened closely while he spoke of Flying Hellcats and Corsairs in WWII, and Banshees in Korea, including ditching in the sea of Japan and being rescued by a helicopter. He is 88 today. About 10 years ago he built and flew a 601. It says a lot to me about the experience of homebuilding that a man who had flown the front line of aircraft in combat in his youth still found homebuilding a vital part of the panorama aviation, something he was unwilling to miss. Listening to this man will likely turn out to be the best hour I spent in aviation in 2012. In another decade, we will still honor the courage of aviators of the greatest generation, but they will be gone, and you will never again be able to listen to one of them while standing in the sun on the ramp at an airport. You will always be able to see a F4U or a F6F at Airventure, or read about the history, but these are just machines and books, and are not comparable to meeting the man. 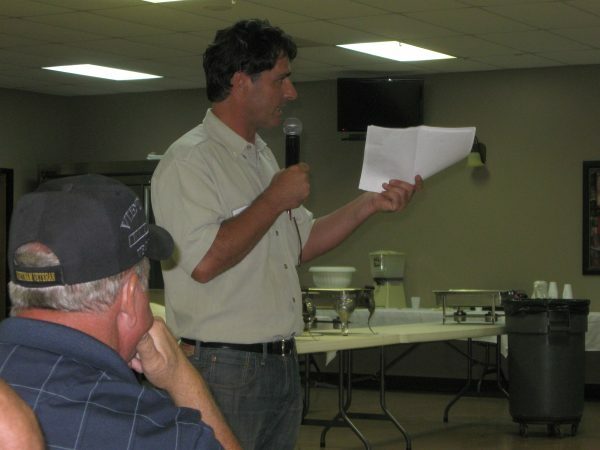 99% of us will never see nor do the things this man has, but as fellow homebuilders you have some common ground with him, a connection that can give you slightly better perspective on his experience. I have casually wasted many hours in my life, but from 3 to 4 pm CST September 22, 2012, I spent one of my hours doing something very worthwhile. We are now approaching Corvair College #24. The event will be a large, full-scale College held at the same location of the highly successful Colleges #19 and #21. Corvair/Pietenpol builder/flyer and Cherry Grove Trophy winner P.F. Beck, and his great crew, again are the location hosts. We have many early indications that this will be the largest and most productive College yet. Although we are just now opening the registration, the prep work for the College has been ongoing for 10 months, and it builds on the outstanding work that P.F. and crew did in earlier years. The online registration is being covered by Corvair/601 builder Ken Pavlou, aka “The Central Scrutinizer.” Ken takes care of all the College registrations for us from the “undisclosed location” (his basement in Connecticut). Hats off to Ken for his long-standing support of Colleges. In recent years, the Barnwell Colleges have become the year end event in the world of Corvairs. They are highly productive, and we have had a lot of engine runs and building progress with a good collection of flying Corvair powered planes on hand, but the events also have a strong social side, where builders can relax in the company of like-minded aviators. Barnwell has seen a lot of married couples and father/son builder teams, and these builders fit in well at the kind of classy events that P.F. hosts. College #24 will also see the 5th presentation of the Cherry Grove Trophy, the award that recognizes the outstanding Corvair aviator of the year. 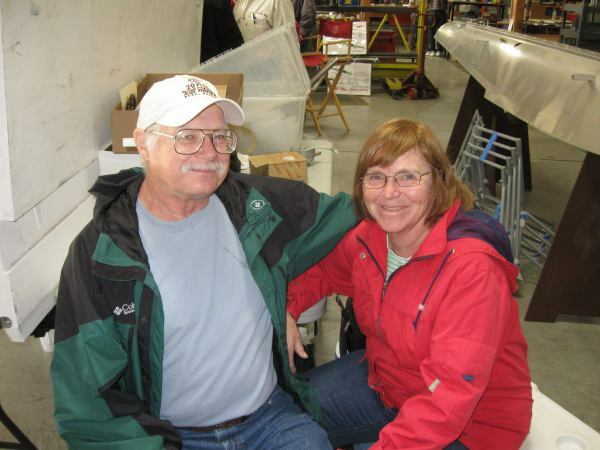 Both Kevin and Shelley are headed to CC#24, where they plan to inspect and run their 2,700cc/Weseman bearing engine. or call the airport at 803-259-1090." Sebastien has directly told me that he welcomes all Corvair builders to the event, not just guys working on Zenith airframes. 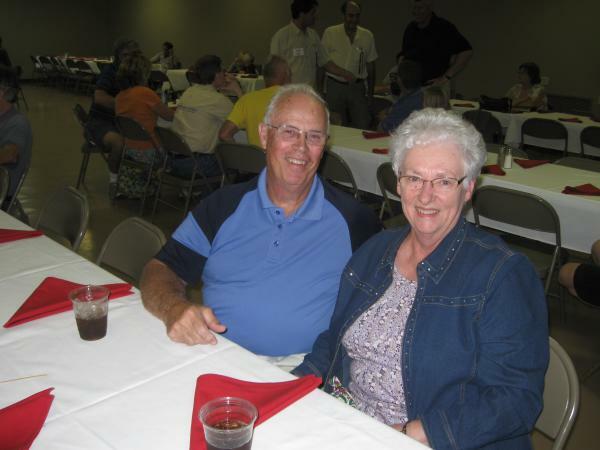 At last year’s event, Grace and I used the opportunity to meet with dozens of Corvair builders from the Midwest. This is an excellent opportunity for Corvair builders to attend an event in their area, have us answer their questions, inspect flying planes, have a “parking lot tour” to see core engines and meet other builders. As always, we will have a full complement of parts, but if there is something specific you would like to pick up, please let us know in advance. 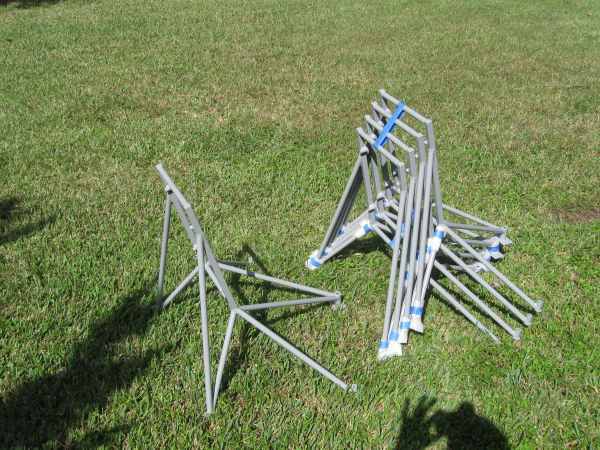 We are planning on having half a dozen powdercoated Zenith 601-650 and 750 mounts on hand. Builders will have a chance to avoid the shipping cost by getting one in person. The main day of the event is Saturday, but I am going to be there on Friday to get a jump on the event and attend the dinner in the evening. Traditionally the open house draws several hundred people, but this year being the 20th anniversary, will likely be a bit larger. Rod Hightower, the president of the EAA, is the Friday night speaker, which gives a good indication of the respect due the Heintz family and crew for their longevity in an industry often marked by here-today-gone-tomorrow LLCs. From a builder’s perspective, it is the ideal sized event to come and learn and get to know other builders. Oshkosh has 200 times the amount of people, but I find the open house to be made of serious builders and planners, not spectators and daydreamers. The entire setting is conducive to builder progress. We will have far more time for one on one questions and answers than at a major airshow. A number of builders with finished Zeniths have said they are making plans to fly to the event. We are going to have a complete Zenith firewall forward installation on hand with a 2,850 cc Corvair mounted on it for display. Again, the event is open to all Corvair builders, and Sebastien and crew will welcome you as their guest, but it will be particularly beneficial to everyone planning on bolting a Zenith airframe to their Corvair engine.